The Nebula Award for Best Novelette is given each year by the Science Fiction and Fantasy Writers of America (SFWA) to a science fiction or fantasy novelette. A work of fiction is defined by the organization as a novelette if it is between 7,500 and 17,500 words; awards are also given out for pieces of longer lengths in the Novel and Novella categories, and for shorter lengths in the Short Story category. To be eligible for Nebula Award consideration a novelette must be published in English in the United States. Works published in English elsewhere in the world are also eligible provided they are released on either a website or in an electronic edition. The Nebula Award for Best Novelette has been awarded annually since 1966. 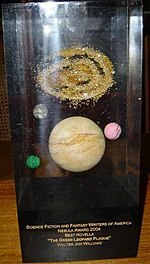 The Nebula Awards have been described as one of "the most important of the American science fiction awards" and "the science-fiction and fantasy equivalent" of the Emmy Awards. Nebula Award nominees and winners are chosen by members of SFWA, though the authors of the nominees do not need to be members. Works are nominated each year between November 15 and February 15 by published authors who are members of the organization, and the six works that receive the most nominations then form the final ballot, with additional nominees possible in the case of ties. Members may then vote on the ballot throughout March, and the final results are presented at the Nebula Awards ceremony in May. Authors are not permitted to nominate their own works, and ties in the final vote are broken, if possible, by the number of nominations the works received. The rules were changed to their current format in 2009. Previously, the eligibility period for nominations was defined as one year after the publication date of the work, which allowed the possibility for works to be nominated in the calendar year after their publication and then be awarded in the calendar year after that. Works were added to a preliminary list for the year if they had ten or more nominations, which were then voted on to create a final ballot, to which the SFWA organizing panel was also allowed to add an additional work. During the 54 nomination years, 213 authors have had works nominated; 46 of these have won, including co-authors and ties. Ted Chiang has won three times out of three nominations, and Poul Anderson, Kelly Link, George R. R. Martin, and Connie Willis have each won twice out of five, two, four, and five nominations, respectively. One of Anderson's nominations was under the pseudonym Michael Karageorge. Ursula K. Le Guin has the most nominations of any author with seven, including one win and not including one withdrawn nomination. James Patrick Kelly and Richard Bowes are tied for the most nominations without winning at six. Ursula K. Le Guin has been nominated for the Nebula Award for Best Novelette more times than any other author. In the following table, the years correspond to the date of the ceremony, rather than when the novelette was first published. Each year links to the corresponding "year in literature". Entries with a blue background and an asterisk (*) next to the writer's name have won the award; those with a white background are the other nominees on the shortlist. ^ "The Diary of the Rose" by Ursula K. Le Guin was initially nominated for Best Novelette in 1975, but was withdrawn by the author before the winner was announced in protest of the revocation of Stanisław Lem's honorary membership in the Science Fiction and Fantasy Writers of America. According to Le Guin, SFWA told her that the work was to be the winner if she did not withdraw it. ^ a b c "Nebula Rules". Science Fiction and Fantasy Writers of America. October 2011. Archived from the original on 2011-07-01. Retrieved 2011-12-12. ^ Flood, Allison (2009-04-28). "Ursula K Le Guin wins sixth Nebula award". The Guardian. Archived from the original on 2009-08-01. Retrieved 2011-12-12. ^ Garmon, Jay (2006-10-03). "Geek Trivia: Science-fiction double feature". TechRepublic. Archived from the original on 2012-02-14. Retrieved 2011-12-12. ^ "Nebula Awards". Science Fiction Awards Database. Locus. Archived from the original on 2016-06-27. Retrieved 2016-07-05. ^ a b c d e f g h i j k l m n o p q r s "Nebula Awards 1966". Science Fiction Awards Database. Locus. Archived from the original on 2015-10-24. Retrieved 2011-12-06. ^ a b c d e "Nebula Awards 1967". Science Fiction Awards Database. Locus. Archived from the original on 2015-10-25. Retrieved 2011-12-06. ^ a b c d e "Nebula Awards 1968". Science Fiction Awards Database. Locus. Archived from the original on 2015-10-25. Retrieved 2011-12-06. ^ a b c d e f g "Nebula Awards 1969". Science Fiction Awards Database. Locus. Archived from the original on 2015-10-25. Retrieved 2011-12-06. ^ a b c d "Nebula Awards 1970". Science Fiction Awards Database. Locus. Archived from the original on 2015-10-25. Retrieved 2011-12-06. ^ a b c d e f "Nebula Awards 1971". Science Fiction Awards Database. Locus. Archived from the original on 2015-10-25. Retrieved 2011-12-06. ^ a b c d e "Nebula Awards 1972". Science Fiction Awards Database. Locus. Archived from the original on 2015-10-25. Retrieved 2011-12-06. ^ a b c d e f g "Nebula Awards 1973". Science Fiction Awards Database. Locus. Archived from the original on 2015-10-25. Retrieved 2011-12-06. ^ a b c d "Nebula Awards 1974". Science Fiction Awards Database. Locus. Archived from the original on 2015-10-25. Retrieved 2011-12-06. ^ "The Diary of the Rose". Science Fiction and Fantasy Writers of America. Archived from the original on 2018-07-30. Retrieved 2018-07-30. ^ Le Guin, Ursula K. (2017-12-05). No Time to Spare. Houghton Mifflin Harcourt. pp. 60–61. ISBN 978-1-328-66159-3. ^ a b c "Nebula Awards 1975". Science Fiction Awards Database. Locus. Archived from the original on 2015-10-25. Retrieved 2011-12-06. ^ a b c d e f g h i j k "Nebula Awards 1976". Science Fiction Awards Database. Locus. Archived from the original on 2015-10-25. Retrieved 2011-12-06. ^ a b c d "Nebula Awards 1977". Science Fiction Awards Database. Locus. Archived from the original on 2015-10-25. Retrieved 2011-12-06. ^ a b c d e "Nebula Awards 1978". Science Fiction Awards Database. Locus. Archived from the original on 2015-10-25. Retrieved 2011-12-06. ^ a b c "Nebula Awards 1979". Science Fiction Awards Database. Locus. Archived from the original on 2015-10-25. Retrieved 2011-12-06. ^ a b c d e f "Nebula Awards 1980". Science Fiction Awards Database. Locus. Archived from the original on 2015-10-25. Retrieved 2011-12-06. ^ a b c d e f "Nebula Awards 1981". Science Fiction Awards Database. Locus. Archived from the original on 2015-10-25. Retrieved 2011-12-06. ^ a b c d e f "Nebula Awards 1982". Science Fiction Awards Database. Locus. Archived from the original on 2015-10-25. Retrieved 2011-12-06. ^ a b c d e f "Nebula Awards 1983". Science Fiction Awards Database. Locus. Archived from the original on 2015-10-25. Retrieved 2011-12-06. ^ a b c d e f g "Nebula Awards 1984". Science Fiction Awards Database. Locus. Archived from the original on 2015-10-25. Retrieved 2011-12-06. ^ a b c d e f "Nebula Awards 1985". Science Fiction Awards Database. Locus. Archived from the original on 2015-10-25. Retrieved 2011-12-06. ^ a b c d e f g "Nebula Awards 1986". Science Fiction Awards Database. Locus. Archived from the original on 2015-10-25. Retrieved 2011-12-06. ^ a b c d e f g "Nebula Awards 1987". Science Fiction Awards Database. Locus. Archived from the original on 2015-10-25. Retrieved 2011-12-06. ^ a b c d e f "Nebula Awards 1988". Science Fiction Awards Database. Locus. Archived from the original on 2015-10-25. Retrieved 2011-12-06. ^ a b c d e f g "Nebula Awards 1989". Science Fiction Awards Database. Locus. Archived from the original on 2015-09-30. Retrieved 2011-12-06. ^ a b c d e f "Nebula Awards 1990". Science Fiction Awards Database. Locus. Archived from the original on 2015-09-28. Retrieved 2011-12-06. ^ a b c d e f g h "Nebula Awards 1991". Science Fiction Awards Database. Locus. Archived from the original on 2015-09-28. Retrieved 2011-12-06. ^ a b c d e f g "Nebula Awards 1992". Science Fiction Awards Database. Locus. Archived from the original on 2015-09-28. Retrieved 2011-12-06. ^ a b c d e f "Nebula Awards 1993". Science Fiction Awards Database. Locus. Archived from the original on 2015-09-28. Retrieved 2011-12-06. ^ a b c d e f "Nebula Awards 1994". Science Fiction Awards Database. Locus. Archived from the original on 2015-09-28. Retrieved 2011-12-06. ^ a b c d e f "Nebula Awards 1995". Science Fiction Awards Database. Locus. Archived from the original on 2015-09-28. Retrieved 2011-12-06. ^ a b c d e f g "Nebula Awards 1996". Science Fiction Awards Database. Locus. Archived from the original on 2015-09-28. Retrieved 2011-12-06. ^ a b c d e f g "Nebula Awards 1997". Science Fiction Awards Database. Locus. Archived from the original on 2015-09-28. Retrieved 2011-12-06. ^ a b c d e f g "Nebula Awards 1998". Science Fiction Awards Database. Locus. Archived from the original on 2015-09-28. Retrieved 2011-12-06. ^ a b c d e f "Nebula Awards 1999". Science Fiction Awards Database. Locus. Archived from the original on 2015-09-28. Retrieved 2011-12-06. ^ a b c d e f "Nebula Awards 2000". Science Fiction Awards Database. Locus. Archived from the original on 2015-09-28. Retrieved 2011-12-06. ^ a b c d e f g "Nebula Awards 2001". Science Fiction Awards Database. Locus. Archived from the original on 2015-09-28. Retrieved 2011-12-06. ^ a b c d e f "Nebula Awards 2002". Science Fiction Awards Database. Locus. Archived from the original on 2015-09-28. Retrieved 2011-12-06. ^ a b c d e f "Nebula Awards 2003". Science Fiction Awards Database. Locus. Archived from the original on 2015-09-28. Retrieved 2011-12-06. ^ a b c d e "Nebula Awards 2004". Science Fiction Awards Database. Locus. Archived from the original on 2015-09-28. Retrieved 2011-12-06. ^ a b c d e "Nebula Awards 2005". Science Fiction Awards Database. Locus. Archived from the original on 2015-09-28. Retrieved 2011-12-06. ^ a b c d e "Nebula Awards 2006". Science Fiction Awards Database. Locus. Archived from the original on 2015-09-28. Retrieved 2011-12-06. ^ a b c d e "Nebula Awards 2007". Science Fiction Awards Database. Locus. Archived from the original on 2015-09-28. Retrieved 2011-12-06. ^ a b c d e f g "Nebula Awards 2008". Science Fiction Awards Database. Locus. Archived from the original on 2015-09-28. Retrieved 2011-12-06. ^ a b c d e f g "Nebula Awards 2009". Science Fiction Awards Database. Locus. Archived from the original on 2015-09-28. Retrieved 2011-12-06. ^ a b c d e f "Nebula Awards 2010". Science Fiction Awards Database. Locus. Archived from the original on 2015-09-26. Retrieved 2011-12-06. ^ a b c d e f g "Nebula Awards 2011". Science Fiction Awards Database. Locus. Archived from the original on 2015-09-28. Retrieved 2011-12-06. ^ a b c d e f g "Nebula Awards 2012". Science Fiction Awards Database. Locus. Archived from the original on 2013-09-22. Retrieved 2014-03-12. ^ a b c d e f g "Nebula Awards 2013". Science Fiction Awards Database. Locus. Archived from the original on 2013-10-14. Retrieved 2014-03-12. ^ a b c d e f "Nebula Awards 2014". Science Fiction Awards Database. Locus. Archived from the original on 2015-09-28. Retrieved 2016-02-22. ^ a b c d e f "Nebula Awards 2015". Science Fiction Awards Database. Locus. Archived from the original on 2015-09-28. Retrieved 2016-02-22. ^ a b c d e f "Nebula Awards 2016". Science Fiction Awards Database. Locus. Archived from the original on 2016-06-27. Retrieved 2016-07-05. ^ a b c d e f "Nebula Awards 2017". Science Fiction Awards Database. Locus. Archived from the original on 2017-05-23. Retrieved 2017-05-23. ^ a b c d e f "Nebula Awards 2018". Science Fiction Awards Database. Locus. Archived from the original on 2018-05-21. Retrieved 2018-05-20. ^ a b c d e f "Nebula Awards 2019". Science Fiction Awards Database. Locus. Retrieved 2019-04-07. This page was last edited on 8 April 2019, at 02:26 (UTC).